Amentotaxus poilanei, as described in in 1989 by (de Ferré et Rouane) D.K. Ferguson in Bulletin du Museum National d'Histoire Naturelle. Section B, Adansonia: Botanique Phytochemie, 11th edition, is commonly known as Poilane's catkin-yew; as well as Để từng Năm and Sam bỗng Nắm in the Vietnamese language. The species name honors collector and botanist, Eugène Poilane (1888 – 1964), who discovered the type specimen in 1946. Description. Poilane's catkin-yew is an evergreen coniferous species of shrub or small tree that grows to mature heights of 50 feet (15 m) tall with a trunk up to 12 inches (30 cm) in diameter, measured at breast height. Descriptions are virtually the same as for A. formosana, with the following differences: Leaves in this species have pointed or blunt leaf tips and narrower stomatal bands on the abaxial surfaces, measuring 1.5 times as wide as the green leaf margins. Stomatal bands are also of a slightly different color than seen in A. formosana. Distribution. This species is native to Vietnam and is only known to be in Kon Tum Province in Ngoc Linh Nature Reserve, Ngoc Pan Massif, on Mt. Ngoc Linh, found growing in high montane, close evergreen rainforest, at altitudes of around 7,500 feet (2,300 m) above sea level. It is locally common but scattered, mixed with broad-leaved (angiosperm) trees and perhaps Nageia wallichiana as the only other conifer present. Rainfall is very high, at least over 3000 mm per annum and cool temperatures prevail due to almost continuous cloud cover. at elevations of It is also reported from two other areas but not yet confirmed. This species is facing a high risk of extinction in the wild due to habitat loss Hardy to USDA Zone 9, cold hardiness limit between 20° and 30°F (-6.6° and -1.1°C). Attribution from: Carol Ann McCormick, Curator of the University of North Carolina Herbarium; http://www.herbarium.unc.edu/Collectors/Poilane.htm; website assessed November 4th, 2018. 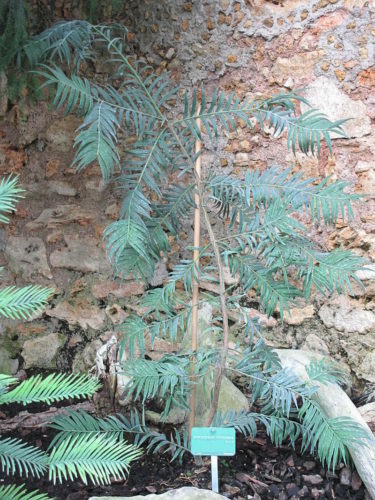 Amentotaxus formosana — a young specimen in the New-Caledonia greenhouse of the Jardin des Plantes in Paris, France.